Save time and money with better shift planning. No more spreadsheets. No more whiteboards. No more-last minute panic. Just a perfect roster, created in minutes, and shared with everyone—wherever they are. With the power of TSheets’ scheduling software you can plan your team’s roster as quickly as you plan your own. A simple drag-and-drop is all it takes to create, edit, and assign a shift. Just choose the time and day, who to assign it to, and share it when you’re ready. Repeat the same shift schedule next week with a single click. Toggle between daily, weekly, and monthly views to get the full picture. Ashley is a restaurant manager who’s saving an entire day each week with TSheets’ scheduling software. What used to seem like an endless task now takes her just a few minutes. And the best part? She now enjoys an extra eight hours every week to focus on managing her team, and giving her customers a five-star dining experience. All your timesheets and rosters in one place. Why use several systems to manage your most valuable resource when one could do it better? With rostering on your time clock, you have a 360-degree view of all your employees—from what they’ve been doing to where they’re going. See instantly which shifts have been assigned, who’s booked time off, and if there are any gaps you need to fill. Sit back and watch your weekly roster turn into a well-oiled operation—with accurate timesheets that sync straight to payroll. There’s a better way to schedule shifts. 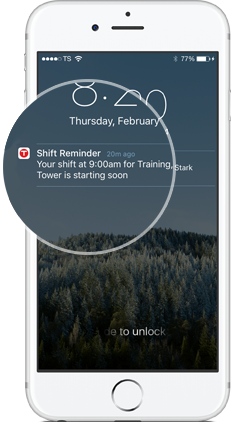 Keep everyone on the same page with mobile and email alerts the moment you assign or change a shift. Just hit “publish” and your work is done! Employees also get reminders to clock in or out when their shift starts and ends. If they forget to clock in, the TSheets app sends a friendly reminder—and a notification to administrators. No more late starts or no-shows!